My Year of True Cycling started so well. Eroica, the Hell Week in Toronto, bigger and bigger training loads for November, December and January. 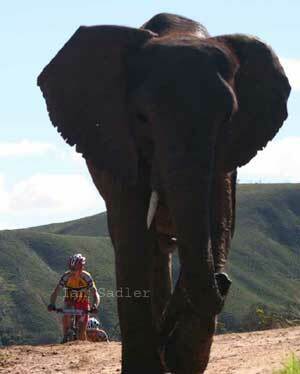 All fantastic and gearing up towards my big block in South Africa culminating in the Cape Epic. The Cape Epic has something mythical for many people, and it definitely has for me. It may have been because of this photo, which is the first I think I ever saw of the Epic. So when the 10th anniversary event was announced for 2013, it was the perfect opportunity to include the Epic. And with my Open Cycle partner in crime Andy also going and our OPEN hardtail ready for action, it was scheduled to be a great experience (not to be confused with a great race, because I have zero illusion that I would be able to keep up with Andy and his riding partner). Also, it would be our first trip to Africa with OPEN, and we were looking forward to meeting up with our early followers there (which includes Cape Epic’s founder, Kevin Vermaak). And then the wheels came off. Andy has his own “Cape Frustration” and was out, then I found myself without a riding partner. Finally, my body mocked my attempts at peak fitness by challenging me to pick up a T-shirt from the floor, resulting in me throwing out my lower back, three weeks of physio and no riding. I just started riding again but the Cape Epic is unfortunately off the Table Mountain. I will still go to South Africa for a short trip and do the Grape Escape, a 3-day mountain bike event put on by the same people that organize the Pick ‘n Pay Argus CycleTour, but the Cape Epic dream will be postponed for one year. On the positive side, that will hopefully give me time to practice my T-shirt lifting techniques and achieve that elusive fitness level. Because there is no doubt that I will ride the Cape Epic one day. This entry was posted on	February 13, 2013 at 12:36	and is filed under Year of True Cycling. Hi Gerard, I wish you a speedy recovery. How about doing La Ruta de los Conquistadores in Costa Rica (24-26 October)? It’s tempting. Falls a bit outside of my one-year span, but since I make the rules myself, I think I can fix that problem! The Cape Epic is a fantastic challenge for the Open hardtail. Honestly if you are looking for a partner next year I’d be keen to do it with you. Where do I sign?? Its crazy how my family live along the Garden Route in a little town called Plettenberg Bay and I’ve tried so hard to get into the Cape Epic and each time I lose out in the ballot. A good family friend did it a few years ago and found it tough. He trained hard and was used to the intensity being a SA U23 Rower but said he was a broken man afterwards. Seriously count me in for 2014, I’ll look after us in SA with real African hospitality, many good fresh seafood braai (barbie), and some good SA wine! ps happy to give you a few tips on places to go when you are there if you have not been before! Hi Togo, supposedly I have a riding partner for next year but we’ll see. Thanks for the offer. Of course I have gotten the advice that you only want to do the Epic with somebody with whom you know you’ll still be on speaking terms at the end of the race. Or somebody about whom you don’t care if you never speak to them again! Ha ha! Count me in either way as your first reserve or if you decide to create a second team for 2014. Enjoy SA and offer stands….You’ll be loving my chat by the end of race! As a happy Cervelo S2 rider, and a competitor, no make that ‘participant’ in this year’s Cape Epic, I’m sorry to hear that you wont be able to join in this year. I was hoping to be able to say “hi” in person, but also to check out the Open. Almost as soon as I started to ride my S2, I wondered if you guys were going to make an MTB, and now that you have, I’d love to see it in action. Hi Brendan, that’s too bad. Where are you from, are you a local? I’m not a local – I’m in Melbourne, Australia. I see that you have a retailer in Sydney, next time I’m up there I’ll try to pop in and have a look at the OPEN. Gerard, very sorry to hear about Cape Epic! Was looking forward to the post ride blog. Maybe you need to recruit a few more brave souls to join you next year! Can the Cape Epic ‘stage’ be done on a cross bike?